* the stocking density must not exceed nine laying hens per square metre of usable area. Picture, if you can, nine hens crammed into a space of 1 meter squared...okay, it's better than a battery cage, but barely. Here are a few quotes on the supposedly "ENRICHED CAGES"
measure fifteen cm with either your fingers or a ruler, and just imagine a hen that can sit on a perch with just 15cm of room. *Droppings must be removed as often as necessary and dead hens must be removed every day. If the hens were happy, healthy and cared for properly, there wouldn't be any dead hens that needed clearing away now would there?? * 8. Subject to paragraph 9, no person shall mutilate any laying hen. (c) in accordance with the Veterinary Surgery (Exemptions) Order 1962.". *(c) are new-born animals in which the navel has not completely healed. *infant mammals and infant birds which are not accompanied by their mother shall not be considered fit for their intended journey if they are incapable of feeding themselves. They must be referring to very young animals if they are not able to feed themselves yet! (b) a journey lasting less than 24 hours for chicks of all species, provided that it is completed within 72 hours after hatching. There are over 20 million battery hens in the UK at the moment. 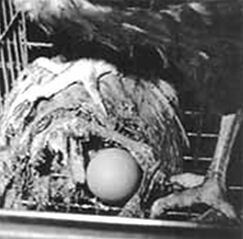 The hens are put into the battery cage when they are 18-20 weeks old, and remain trapped in the cages for an average of 52 weeks before they are taken to be killed. They never see fresh air (apart from when they are crammed into crates and driven to their deaths) and they never get to scratch about in the soil, spread their wings or fly. 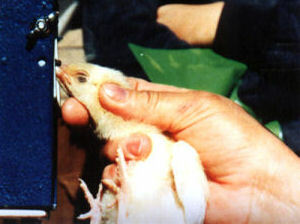 70% of eggs in the UK are produced by battery hens. People are still buying battery eggs because they are cheaper than the free range eggs. Only 24% of eggs come from free range hens. A typical battery cage measures around 45cm x 50cm (18" x 20"). The cages are similar size to a piece of A4 paper. There are supposed to be four to five hens in one cage, however many battery farms ignore this and cram as many hens into one cage as possible. I count at least seven hens in this picture, how many can you see? Definitely more than five, anyway. 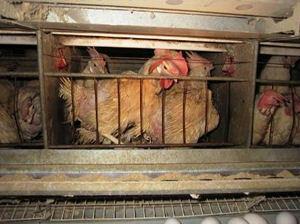 At just 20 weeks old battery hens are taken and forced into the tiny cages. They are expected to live, lay, sleep and eat in this condition for a year. 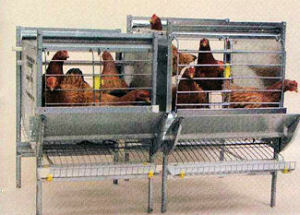 After that they are considered to be 'spent' hens and will be crammed into crates and taken to slaughter. After this, a new 'batch' is brought in to replace the old batch. The cage above left is the type currently being used, and the cage on the right is an ‘enriched’ cage which is to be brought into effect from 2012. 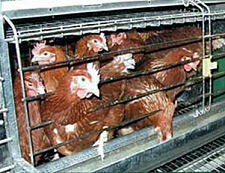 The conventional battery cages (above left) will be banned as of 2012, however, it will be legal for the existing battery cages to be replaced by the 'enriched' cages (above right). Most battery hens suffer from, at one stage in their life, broken bones. Due to the lack of exercise and over-production of eggs their bones are brittle and more easily broken. 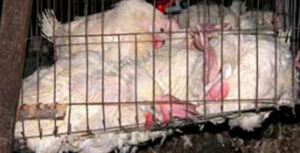 By the time battery hens are slaughtered, 90% have suffered painful and untreated fractures. Also, I dunno if this should go under another heading, but I would like to add that many hens suffer foot injuries from standing on the wire mesh floor of the cages for 24 hours every day. This can cause painful welts, trapped toes and broken toes. The lighting in the sheds is very important. It pushes the hen’s body to lay even more eggs. This can cause tumours and another common result is acute calcium deficiency leading to 'layer fatigue'. This is when the hens body can take no more, and she just collapses. Around autumn time hens go through a period of moulting. This is where they lose their old feathers and grow new ones. During this time the energy that usually goes towards laying eggs is used instead to grow the new feathers. This means that, for the two or three months that the new feathers are being grown, the hens are off-lay. To try and reduce the amount of time the hens aren't laying the farmers semi or completely starve the hens during this period. 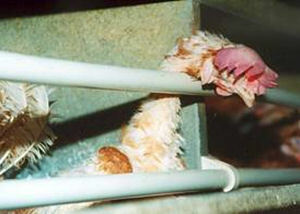 Many hens die during the process. Hens have lots of natural instincts, such as finding somewhere dark and peaceful to lay their eggs (something not possible in a battery cage), keeping on the move from dawn till dusk (not possible in a battery cage) and dust bathing to get rid of mites and other parasites (also not possible in a battery cage). As there is nowhere for the hens to dust bathe, the need to do so builds up until eventually the hen is forced to perform a 'vacuum' dust bath, where they go through the motion of a dust bathe on the cage floor. This can be very dangerous to the hen’s mental and physical health.